Weltschmerz ran deep at the New York Society for Ethical Culture in Manhattan in January when Glenn Lowry, the director of the Museum of Modern Art, and Elizabeth Diller, of Diller, Scofidio and Renfro (DS+R), defended their recently announced plans for the museum’s expansion. These have sparked controversy because they include razing the neighboring, now-empty American Folk Art Museum building, designed by Tod Williams and Billie Tsien, and purchased by MoMA in 2011. The vitriol from the local critical and architectural community has been raucous, ad hominem. The crowd at Ethical Culture wanted blood, to see DS+R taken down a peg, shamed. Why? To be sure, the quirky little building—which opened in 2001, just after 9/11—is worthy of defense: it is a beautiful and unusual work with the remnant scale of a row-house street now being super-sized, and built with the kind of artful detail so absent from the bland glass behemoths of the day. But more generally, that some 600 people turned out on short notice to stand up for the structure speaks to the sense of disillusion with the architecture and development practices that flourished during the real estate–driven Bloomberg era. And being presented with a fait accompli—“We’ve made our decision,” announced Lowry—only aggravated the crowd’s sense of frustration with MoMA and DS+R. Many of us feel especially proprietary about MoMA because it is a quintessential New York institution, and we closely identify with its joys and its betrayals. My own special memories are of college breaks during the 1960s, trying to pick up Bennington girls among the Matisses. (I was rebuffed.) Generations of visitors from the city and the world have been schooled in the cultures of modernity by its galleries, its cafes, its book shop, its screening rooms, its sculpture garden. The sense—especially since the misbegotten shopping-mall-style expansions of César Pelli and Yoshio Taniguchi in 1984 and 2004, respectively—is that the museum has sold out to a homogenizing commercialism, a feeling inflamed by this latest enlargement of its “campus,” a weird and preening misnomer for a row of buildings. The Folk Art Museum is perceived as a barricade, a point of resistance, not simply to a rampaging goliath that has progressively made us feel less special as a public as we negotiate its airport-concourse crowds and Broadway prices, but to what is happening to the city more broadly. It’s worth recalling that the three floors of the museum’s primary expansion are to be housed in the base of a ridiculously tall midblock tower for the hyper-rich. Clearly, the little building is seen as a last barricade against not only the foregone outrage directly next door, but also its acromegalic kith rising throughout the neighborhood, homes to absentee oligarchs swooning over their Damien Hirsts and Jeff Koonses and other pieces of asset art. There’s plenty of disquiet in the culture about the role the museum plays in all this, as validator and co-conspirator, and now it’s spilling out. In the mix, too, are feelings about the brutalization about to be visited on that dear old friend, the New York Public Library, which seeks to transform itself by eliminating from its Central Library on 42nd Street a crucial element of its architecture and function—its marvelous, structurally integral book stacks. Of course, without them, the books too will have to go, to make way for a more “democratic” concept of what it means to use a library. Although the Folk Art Museum is practically new, its demise is clearly associated with the specious imperatives of a faux-populist disrespect for revered traditions (the printed book, the quietude of scholarship, the rhythm of the variegated street wall, the art of craft) and with that more general anxiety about all that is solid melting into air—or glass. The problem on 53rd Street is not just encroachment but a lack of respect for defiance and difference, qualities that modern art has historically affirmed but which at MoMA have been weakened by institutionalization. MoMA and its architects do try to argue for a restoration of some idea of edginess by claiming that a new generation of curators is aboard and ready to experiment. The case for demolition is couched in terms of facilitation rather than constraint, but many perceive that the removal of the irritant—the sand grain that might have produced a pearl—in favor of the noncommittal (the installation of a retractable glass wall, an “Art Bay” and a “Gray Box”) is an assault on the specificity of art itself. These new spaces represent avant-gardism at its most deracinated, and the idea of filling the ghosted outline of the razed and, in Diller’s word, “obdurate” little building with these rigorously vague spaces seems a gesture of melancholy resignation. As several people pointed out at Ethical Culture, DS+R has done a meticulous, exacting job of proving a false premise. Once its client established that efficient circulation was the sine qua non of the expansion, the Folk Art Museum could only be perceived as an impediment rather than an asset. It isn’t that the building couldn’t have been saved but that there was, finally, no will to save it, no love. That would have required some imaginative delight in the stimulations of archaeology and exception, an interruption in the smooth horizontality of MoMA’s vision of flow. DS+R has canny and skilled designers, and many of the intermediate renderings they presented showed fine strategies for incorporating the Folk Art building into the larger ensemble, filled with hints of a suggestive and productive merger. It was sad to see them forging on with attempts to thoroughly assimilate the found object into a set of routines that were simply anathema to it, finally deciding to obliterate it as though, having inexorably designed their way into a box, they genuinely had no choice. Although DS+R and Williams and Tsien are generational contemporaries, steeped in modern art and experienced designers of spaces for it, they represent divergent streams in architectural modernism. DS+R is an apt choice for MoMA because it is a direct legatee of the Bauhaus tradition, with its aura of functionalist architecture, craft and performance. Williams and Tsien, on the other hand, are more clearly linked to a branch that includes Frank Lloyd Wright, Louis Kahn, Carlo Scarpa and, perhaps especially, Paul Rudolph—known for his brilliantly unyielding interiors—and other exponents of a thicker sense of materiality and of a specific style of complex orthogonality. Although their work is not demonstratively eccentric, their predilection for density and traditional construction contrasts with DS+R’s penchant for transparency and ornamental technology. At the evening session, Lowry, in response to a question about how he could trash a building when he’d never do the same to a painting, distinguished the character of architecture on the basis of its functionality, taking the issue of the Folk Art Museum’s future out of the realm of “preservation” and placing it in the more tenuous category of “adaptive re-use.” Could it be made into a good gallery, hallway, cafe, something other than it was designed for? Which means, of course, that the more precise the original design intentions, the more likely the demolition. The question, clearly and honestly articulated by Diller, concerned how much of the building could be modified or removed before some essential singularity was snuffed. Her account reminded me of “The Birth-Mark,” the story by Nathaniel Hawthorne. Gazing on his beloved, a scientist becomes obsessed by a birthmark he feels is her only flaw and wonders if it can be removed. She responds that the mark “has been so often called a charm that I was simple enough to imagine it might be so,” but submits to her husband’s desire. You know the rest: he concocts many formulas and finally discovers one that excises the mark but, in so doing, kills her. This death by transfiguration suggests another irony. Williams and Tsien are the designers of the new building for the Barnes Collection in Philadelphia, warmly greeted by nearly every critic who has trashed DS+R over the MoMA job. Although the original Barnes building was not torn down after the collection moved, there are legions who still fervently believe that the context it provided for the collection was coterminous with the collection itself, that the symbiosis of art and domestic space was the genius of the place. By any ethical measure, this does not suggest that MoMA’s demolition is some kind of karmic payback, but the parallel should prompt Lowry to think further about MoMA’s own context, a neighborhood that it is helping to eviscerate by its refusal to value its neighbor’s artistry. Investigating the seam between art and architecture has long been the stuff of DS+R’s practice. Its breakthrough work was the great “blur” on Lake Neuchâtel—a building formed from mist, not simply a fantastic installation but one that strongly identified architecture with the immaterial and the performative. DS+R’s professional quest, in many ways, has been to retain that project’s qualities of ineffability in more orthodox and concrete circumstances. The High Line (designed with James Corner) has been terrific because the project—an adaptive re-use long gestating in the minds of many—enjoyed such a singular and congenial armature, focused such widespread desire, and because its additions to the old viaduct were a canny combination of lapidary minimalism and fecund and ever-transforming plantings. Likewise, its renovations to Lincoln Center were inscribed on a strong but deficient template, becoming part of an enriched palimpsest that they cured of much of its inefficiency, imperial stodginess and inconsistent detail. Alas, this is a wan substitute for the genuinely political, which depends not on the generosity of private interests but on the creation and reinforcement of a genuine public realm, based on real public participation in the decisions that affect it. This dual dilemma was surely on the minds of those at Ethical Culture, and the disappointment at being invited to participate after the fact was galling. Likewise, the question of preservation, and the fraught discourse of precisely what was to be preserved, was too easily dismissed—by belittling it, for example, as “facadism.” Indeed, for many of those in attendance, the argument for saving the Folk Art building is that it is a work of art, full stop. It’s a good enough argument, but so is the idea that certain buildings—via their presentness, familiarity or eccentricity—are crucial parts of the city’s fundamental physiognomy, a quality difficult to codify through the normal routines of artistic or historical judgment. But these values are central to the city’s sense of memory, respect, even compassion, and they must be fought out in a court without laws. Whatever the specific architectural merits of the Folk Art Museum, it is clear that its function on 53rd Street is, in part, as a last bulwark of a midtown in which the midblocks were reserves of row houses, elaborately expressed and in happy contrast to the larger towers on the avenues. 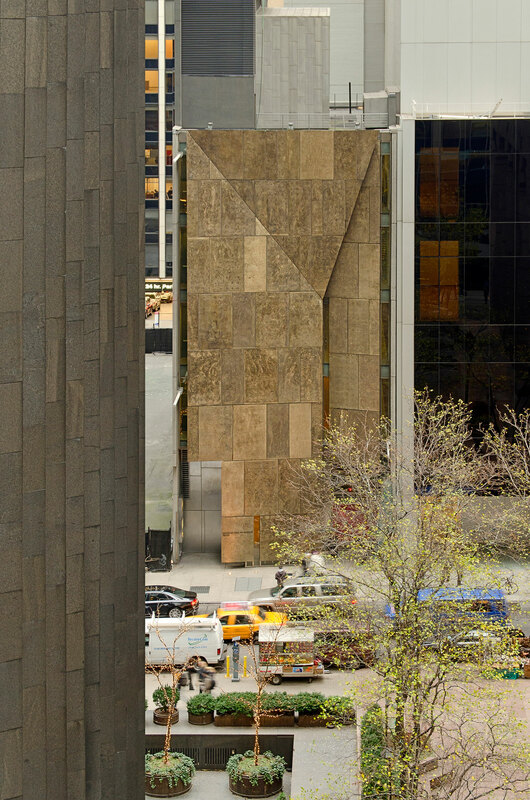 By demolishing the Folk Art Museum and snuffing out its exceptionality, MoMA abets a money-mad engine in which nobody bats an eye at an eighty-story tower in the middle of the block but can’t find a way to save the lovely little treasure next door.